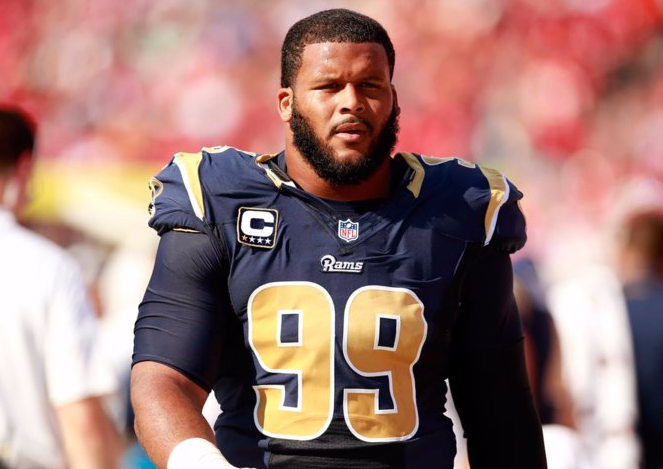 Aaron Charles Donald simply named Aaron Donald is an American football defensive end who plays for the Los Angeles Rams of the NFL (National Football League). He was drafted by the Rams in the first round of the 2014 NFL Draft. His playing position is Defensive End. He is a very talented player. Being Defensive tackle who was selected 13th overall in the 2014 NFL Draft by the St. Louis Rams. He won the Outland Trophy for the NCAA's top interior lineman in 2013, while anchoring the University of Pittsburgh defense. 27 years, Aaron was born on 23rd May 1991 in Pittsburgh, Pennsylvania. His nationality is American. He attended Penn Hills high school and later graduated from Pittsburgh college. His birth sign is Gemini. Aaron stands 1.85 m tall and has the balanced weight of 127 Kg. Aaron started his career from his High Schol and played for Andrew Slome, coach. Later, he was selected first team All-State Class AAAA. By Rivals.com, he was rated as the 37th best defensive tackle in the nation. Donald later started his college career as a freshman for 13 games. In the year 2011, he played as a sophomore and then he moved into the starting lineup, and turned in a breakout campaign. He recorded 47 tackles, including 16 for loss, 11 sacks, and one forced fumble. He has also named a second-team All-Big East selection. 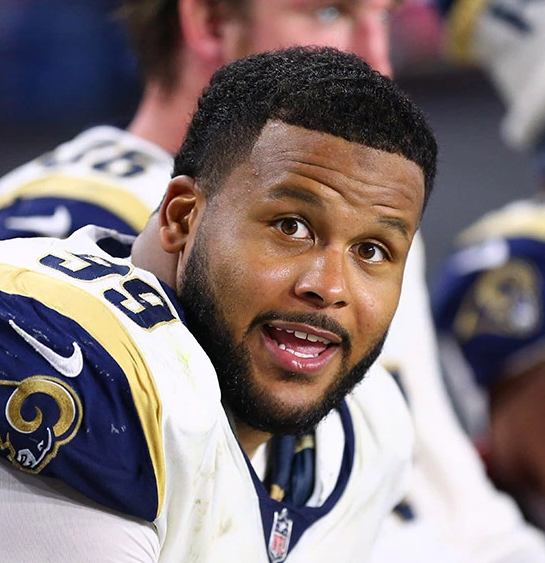 Donald was drafted in the first round with the 13th overall pick of the 2014 NFL Draft by the St. Louis Rams and signed for this team to a 4-year contract with a fee of $10.13 million on 16th June 2014. He made his debut against Minnesota Vikings on 7th September 2014 and finished the game with 4 tackles. He also won the NFL Defensive Rookie of the Year award. He started his 2015 season against Seahawks and ended the season with 69 tackles, 11 sacks, a pass defended, and a fumble recovery. He was also ranked 14th by his fellow players on the NFL Top 100 Players of 2016. Later, in the season of 2016, he was ejected from the team for making an illegal contract with a referee on 12th September 2016 and was fined $21,269. He finished the 2017 season with 41 tackles, 11 sacks, and five forced fumbles. He started his 2018 season, by signing a six-year contract with a fee of $135 million keeping him under contract through the 2026 season while making him the highest paid defensive player in NFL history. Aaron is a very secretive person. He has not spoken anything about his love life to the media. He may be married or unmarried. There are no any rumors about him till now. Aaron is very successful in his career life as well as in his personal life. His net worth is estimated to have more than $10 Million. His salary is still to figure out. His net worth is estimated to have more than $10 Million. Recently, he has signed with a fee of $135 million. He won the Outland Trophy for the NCAA's top interior lineman in 2013. Aaron started his career from his High Schol and played for Andrew Slome.